Lingzhi - the most famous medicinal mushrooms in the world, used in medical practice for 4,000 years! In traditional Chinese medicine, Reishi awarded "superior" category in terms of the breadth of exposure and lack of side effects. Mushrooms are rich in vitamins B3, B5, C and D, and minerals such as calcium, phosphorus and iron. What substance Reishi cure cancer? Famous fungal beta-delta polyglucans. Fungi Research has shown that their anti-cancer effect due to the contained polysaccharides and fatty substances that are ergosterol, and have strong antitumor effect, which contributes to the regression of malignant and benign tumors. Ganoderovye acids have anti-allergic effect and improves the absorption of oxygen. Clinical trials have shown that more than 65% of patients Reishi normalized blood pressure, the fungus is effective for symptoms of cardiovascular blockade, angina, palpitations, arrhythmia, insomnia, fatigue. Special therapeutic value of Reishi mushroom has for diseases of the upper respiratory tract. Almost mystical properties Reishi is its ability to raise the power of the spirit, enhance positive emotional state. This drug is recommended to be used after consultation with your doctor! 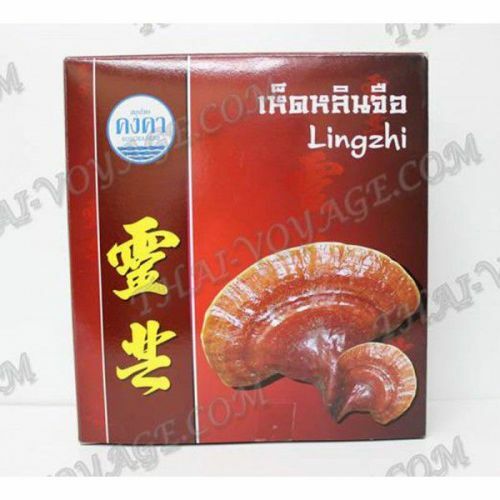 Application: home dry Lingzhi mushrooms pulverized and brewed as a tea, or make alcohol tincture. 1. Broth: mushrooms cut into slices, boil for 5 minutes, then 30 minutes of pushing. Before use, you can drink at will warm up, filter and drink as tea, enough for one person 3 - 5 grams of dried mushrooms per day. 2. The broth in a thermos: brew 2 Mushroom Records in a thermos at a temperature 90 degrees and press for a few hours. Take 100 ml of the drink three times a day before each meal. 3. Broth from Lingzhi mushroom minced 2 tablespoons of mushroom powder, pour 350 ml of water, bring to a boil and simmer 5 minutes. The resulting broth pour into a thermos and insist for 10-12 hours. Ready infusion stored in a refrigerator. 4. One tablespoon of Lingzhi pour 500 ml of water and cook, stirring, over low heat for an hour. The aqueous decoction take 1 tbsp. spoon 3-4 times a day before meals. 5. You can add Lingzhi in Pu-erh tea or red in small quantities (0.5-1 g. Per brew). 6. For alcoholic extract prepared tincture in vodka or alcohol, should take 100 grams of mushrooms, grind in a coffee grinder, pour vodka (0.5 liters), put in a warm dark place for 2 weeks, take a teaspoon of 2 - 3 times day. You can use fresh mushrooms. The infusion of fungus should be stored in the refrigerator for 2 days. Dry mushroom, powdered a pinch per serving can be added to different dishes for 5-10 minutes until cooked. Infusion Lingzhi combined with the taste of black Puerh. The adoption of the fungus Ganoderma should be consistent with an individual diet. To be effective, Lingzhi properties must be fully aware of and to direct its action on the necessary course of treatment. You should understand that treatment with Lingzhi fungus - a lengthy process (it takes time for one - two years), but effective, and does not cause any side effects!